5793 labyrinths found. Showing 2881-2900. Sorted by country, state, city, then zip/postal code. 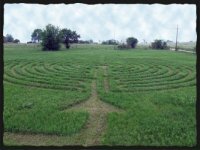 11-circuit labyrinth mowed into field on private property in the country west of Lawrence, Kansas. Open to public. Special events on occasion. Wheelchair accessible, but this is situated in a field with mown paths leading to the labyrinth with 25 inch mown paths. Private property, but open to public - contact David Bartholomew and Joan Clark, owners/creators. 11-circuit labyrinth of the "Chartres" variety. Mown into natural prairie. 25 inch paths, 25 inch separation between paths. 8 foot center. Curved benches in center circle for sitting/relaxing/prayer/meditation. Custom designed for season or holy day of natural seashells and rocks enhancing particular spiritual needs for worship, raise consciousness, heighten esprit de corps, enlighten experience that God be glorified. I-435 to 95th Street: Turn east to Pflumm. I-35 to 95th Street: Turn west to Pflumm. At 95th & Pflumm, turn north and look for the labyrinth on your left, in the middle of the broad greenspace. All are welcome during daylight hours. KS Turnpike, exit at Cassoday, turn right (north) at stop sign, travel 8.4 miles to 55th rd (when you see a 40mph sign) the turn is first right on 55th rd, travel 5.5 miles to Walk in Peace Ranch. It varies. 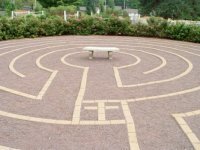 We have solstice/equinox celebrations at our Peace Garden where our labyrinth is located. A youth group from a local church walking the Circle of Peace labyrinth at Prairie View. Since its 1954 founding, Prairie View has situated itself as one of the leading cutting-edge treatment facilities in the region, fostering healing and growth in families and individuals. Reserved for staff and client use during the week. Open to the public beginning at dawn to 8:00 AM weekdays and all day on weekends and holidays, beginning at 4:00 PM Friday. located in the southeast corner of the property. Classic 7 circuit, has become more circular shaped when 48" mower cut was replaced with 42"
Turn on 102nd and Nall, turn right into the church's parking lot and drive east. Labyrinth is located on the north east end of the property, next to the vegetable garden. 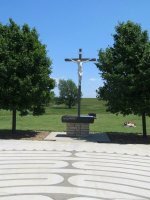 The prayer labyrinth is located on the west side of the Meneilly Center for Mission campus operated by Village Presbyterian Church. It resides next to the Village Community Garden and the Village Food Pantry and Clothes Closet. Parking is conveniently available next to the prayer labyrinth. See map at: www.firstpresbywichita.org website - click on "Family camp"